A typical work outfit. That's why I jazzed things up a bit with this mouth-watering green of a wall. Who knew this BCBG dress would look so watermelon-rific next to it? Makes you ready for summer, huh? Or perhaps just hungry? Or both? Apparently though, it was a reserved parking lot, (whoops). I just loved how the sign read "Parking For: Baboo and Sinai Schroeder Law Offices." Because everyone knows Baboos come before lawyers. And they get very angry when you park in their reserved parking spots. Happy Tuesday, everyone! And as a sneak peak, a lovely DIY masterpiece is coming your way within the next 24 hours. But if you skip out on me to catch up on re-reading Harry Potter, I completely understand. No hard feelings. Dress: BCBG high-waisted dress, scored it at Ross for $100 off! Color!! I'm a big fan of bright colors. That bright wall was a great idea. love your necklaces and thetop is a great color . That top is amazing!!! I love the slight bubbled sleeves. It makes it more interesting. And I love that you paired it with a lowkey gray pencil skirt. You look fab!! you are so chic and pretty !! lovely outfit!! Loving every single thing about this look. Hot! 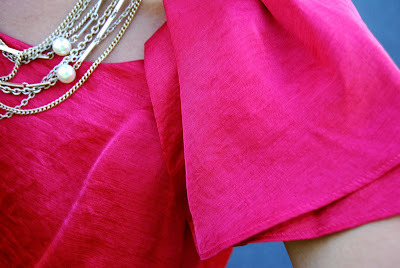 your close-up photo of your sleeve and necklace is amazing! something about the different textures is making me say wow! as always your skirt is beautiful!